ONE WAY TO COPE WITH MONTANA’S LONG WINTERS is to embrace them, and perhaps the best way to do so is to suit up and go skiing. At least this was one family’s approach when determining where to build their new home in Big Sky, Montana: Proximity to the slopes was a top priority. “The biggest thing for the homeowners is they have two small children, and this is a home for them to ski,” project architect Andy Daigle explained. Located at the base of a private ski mountain in the Yellowstone Club, the Hillside Snowcrest residence was designed by Locati Architects to embrace the elements and bring a family closer to the beauty of Montana’s winters. 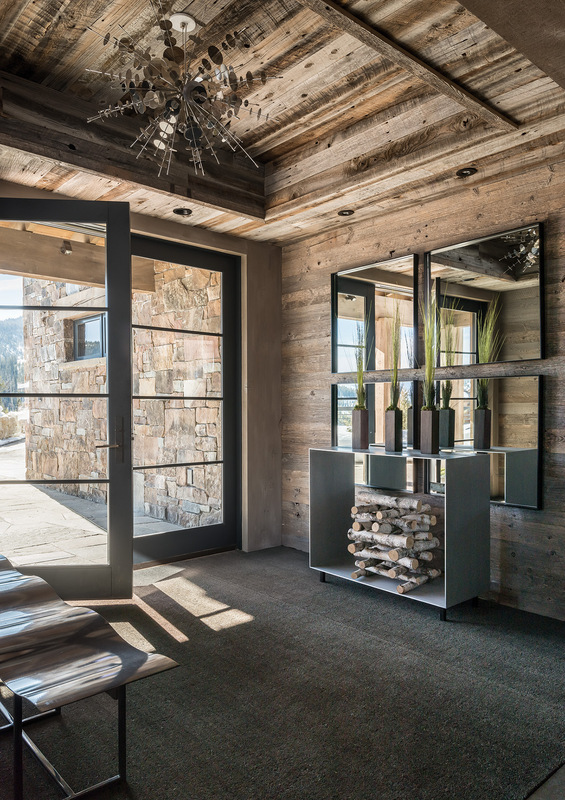 From the doorway of their cozy ski room (located off the home’s front entry), it’s a quick slide to the nearby chairlift, magic carpet, and inner-tube hill. 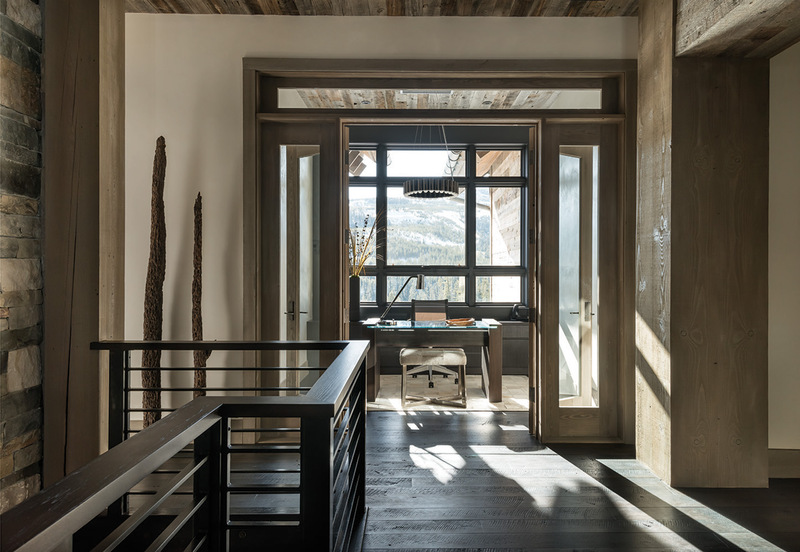 Built by Schlauch Bottcher Construction, the home incorporates clean contemporary lines that blend seamlessly with the more rustic materials one might expect of resort architecture. 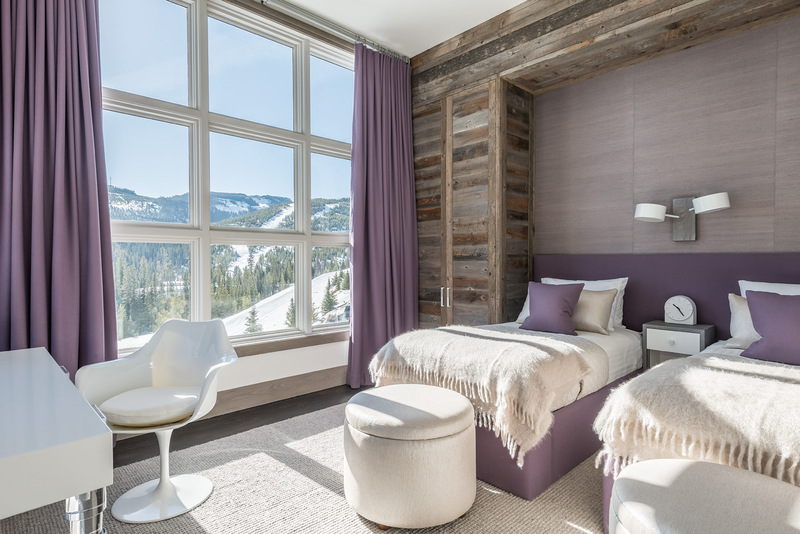 Designed in the spirit of a mountain contemporary chalet, the duplex overlooks the Warren Miller Ski Lodge and what will soon be the Village Core, a 475,000-square-foot building that redefines the heart of the Yellowstone Club. 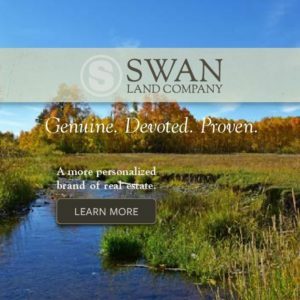 Fully customized to reflect the personalities and needs of the homeowners, Snowcrest also stands as an example of the shifting perspective in Northern Rockies architecture. Daigle said that some 20 to 30 percent of projects Locati now designs incorporate more contemporary elements. 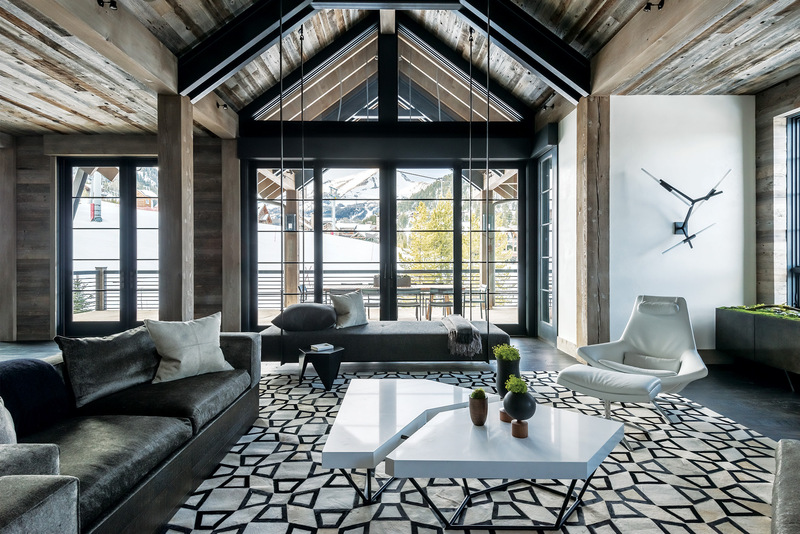 In addition to being close to skiing, the homeowners wanted their new home to be uncluttered, a great place for entertaining family and friends, and include a functional layout that was casual and comfortable. They also wanted to incorporate certain materials, such as rough-sawn reclaimed oak for the floors, and corral-board siding, while keeping the overall aesthetic minimalistic and contemporary. Completed in 2014, the nearly 10,000-square-foot home was designed as a series of tiered spaces. 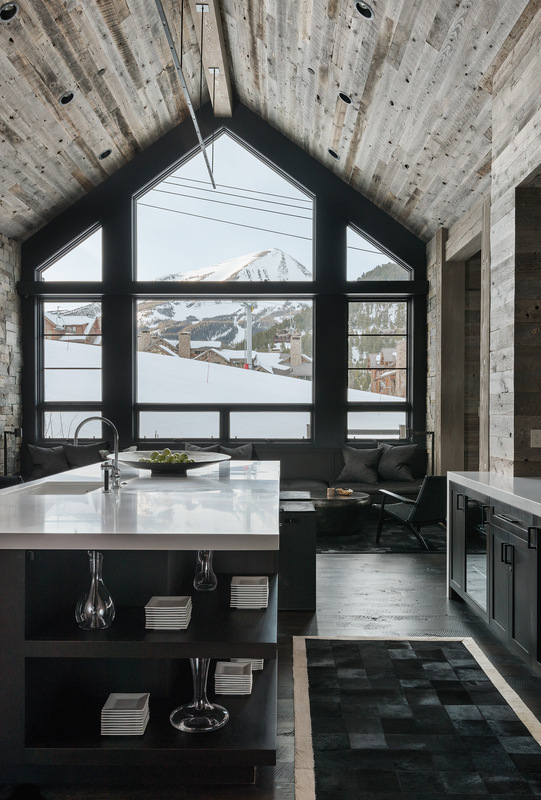 The formal entry is flanked by a ski room and a discreet caterer’s kitchen. From there, a central staircase leads to the second-floor guest suites and third-floor master suites. On the second floor, a bunk room and guest bedrooms are complemented by a comfortable living room with a bar, pool table, and plenty of space to relax after skiing. The guest bedrooms mirror each other across a hallway, and a bunkroom is the perfect hideaway for visiting children. 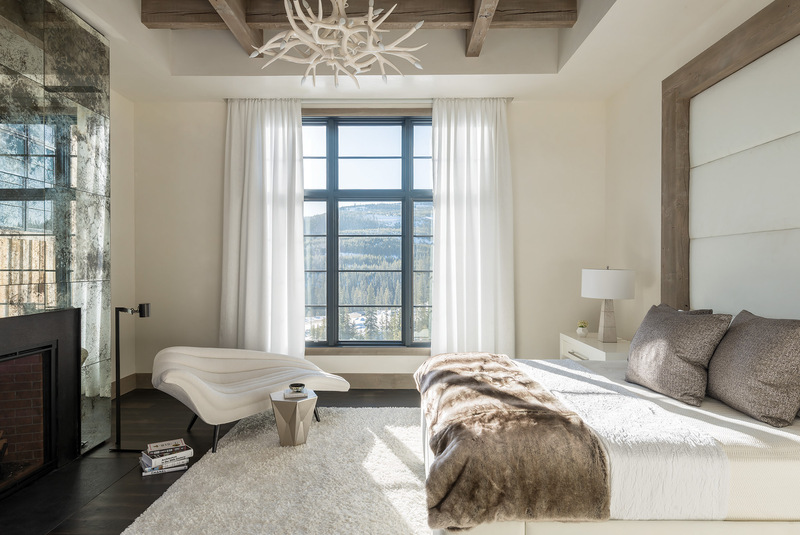 The third-floor master suite takes advantage of views of the ski hill and faces the iconic Lone Peak. An open floor plan leads from the kitchen through the dining room, and into the living room where lift-and-slide glass doors open up to a wide porch, extending the living space outdoors. Daigle’s challenge was to break up the volume of this area so that the home still felt comfortable when only the four family members were there. The architect created three distinct spaces by altering the ceiling planes, and by designating appropriate proportions for how each space should function. In the dining room, a low ceiling and light fixtures create an intimate area, while the elevated ceilings in the great room denote its prominence. The kitchen ceiling arches upward as well, creating a spacious feel for dinner parties, and keeping the space open and airy. Tucked off the kitchen is a coffee bar and, on the opposite side of the room, a comfortable breakfast nook provides the perfect spot for reading or casual meals. Located adjacent to these public areas, a get-away office makes smart use of space and offers a quiet place to work. It also separates the master bedroom from the two children’s bedrooms. By keeping the home’s ornamentation minimal and using materials rich in character, the finishes became artistic statements. Daigle explained that he collaborated with interior designer John Vancheri to design unique elements throughout the home, such as the floating sofa in the great room and the built-in bookshelf that separates the kitchen and dining room. Additional built-in features, such as desks, shelves, and console tables, keep the home uncluttered and refined. 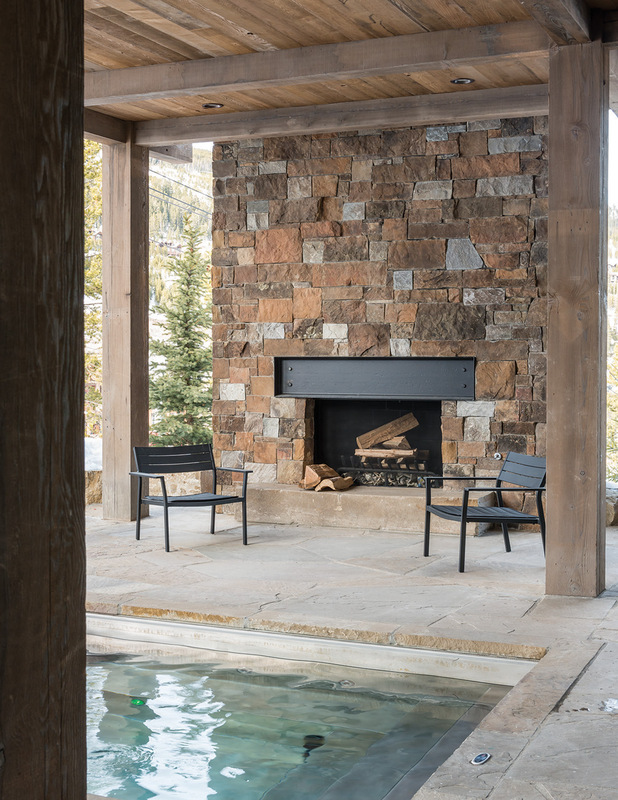 And as with any Montana ski chalet, the home’s design recognizes the importance of outdoor spaces, with two outdoor fireplaces, lots of outdoor seating, and a recessed hot tub on the ground level near the ski room. 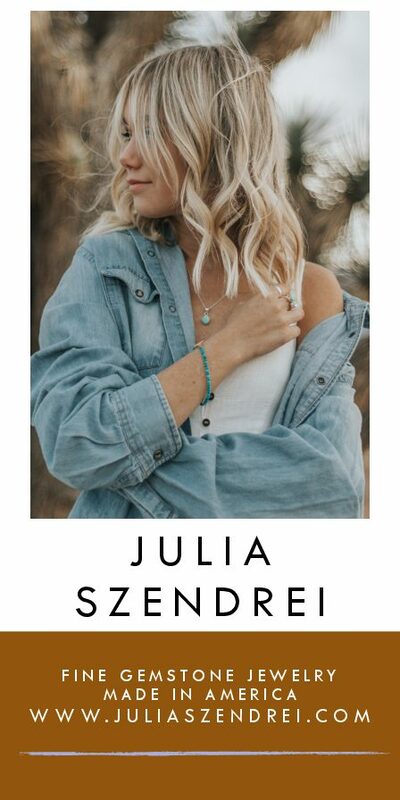 And through that process, the firm designed a home that settles right into place on the mountain slope, providing the perfect setting for endless memories created under the big sky. 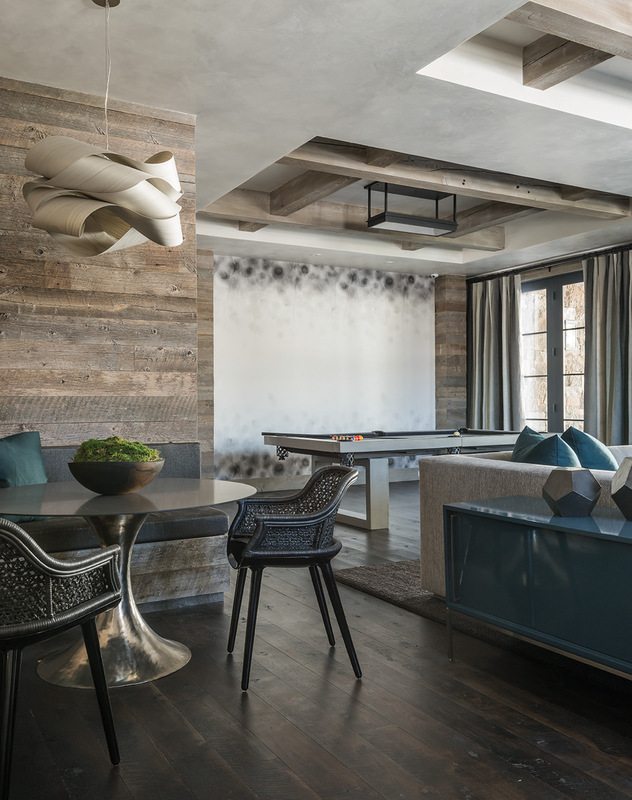 The design team worked together to artfully combine steel elements with rustic, reclaimed timber. The home’s design showcases the building materials, allowing sleek lines and tough surfaces to act as decoration. The floating sofa in the great room was the idea of interior designer John Vancheri. Warm neutrals, contemporary furnishings, and a pop of artful color make the great room a serene escape that is also multifunctional — perfect for entertaining or spending time together as a family of four. The home’s elegant, formal entry leads to a staircase that climbs to the second-floor guest suites and third-floor master suites. On either side of the entry is a discreet caterer’s kitchen and a gear room for skis. Locati Architects designed outdoor areas to extend the home’s footprint while maintaining privacy. The second-floor bunk room offers plenty of space and an “en suite” bathroom so that visiting family and friends can feel at home. The second floor was designed with visiting family and friends in mind. Along with a bunk room and guest bedrooms, there is a comfortable living area with a bar, lounge, and space to play a game of pool. The home’s open floor plan is perfect for entertaining. Appliances in the kitchen are hidden, leaving the space polished and uncluttered. Two guest bedrooms mirror one another on opposite ends of a second-floor hallway. The master bedroom incorporates unique finishes, such as a mirrored wall of glass that conceals a television. Even the office offers spectacular views of the surrounding landscape, a key factor when working during a vacation.